From the File Menu select Info and click the +Add Account button. Select Manual setup or additional server types and click Next. Enter the following details: User Information - Your name, Your CloudETB.ie email address. Server Information - Select IMAP from the drop down list of Account Type. Enter imap.googlemail.com as the Incoming mail server and smtp.googlemail.com as the Outgoing mail server. Logon Information - Enter your CloudETB.ie email address and password. Click More Settings. 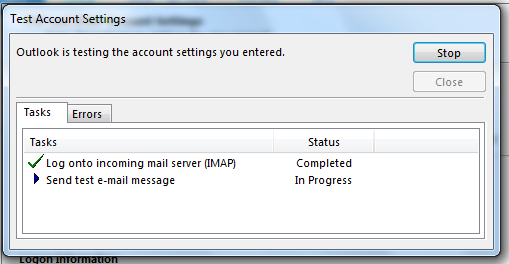 On the Outgoing Server tab check My outgoing server (SMTP) requires authentication and select Use same settings as my incoming mail server. On the Advanced tab select SSL from the drop down list on the Incoming Server Use the following type of encrypted connection. On the Outgoing Server enter 587 and select TLS from the drop down list inthe Use the following type of encrypted connection. Click OK, you will be returned to the Add Account screen, click Next. A test email will be sent to your new account and you should see the following message. If successful click Close and Next, otherwise review your settings and try again. The following message will be displayed. Click Finish. Copyright © 2013 Dublin & Dun Laoghaire ETB. All rights reserved.